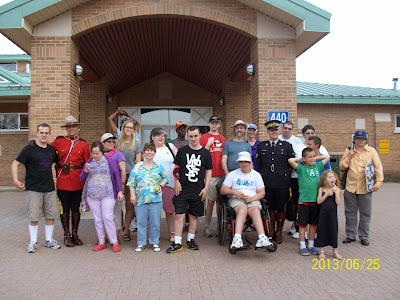 On June 27, 2013, a few athletes were welcomed by two RCMP officers, Corporal S. Williamson and Constable J. Aimimir. Corporal Williamson took the group on a tour of the stables where he explained a little history, showed an old fashioned carriage, and how the horses were trained each year. Then we were escorted into the stables, where each horse had their own stall, the athletes had a chance to see all the horses and touch one or two that were going to be part of the Sunset Ceremonies. http://www.rcmp-grc.gc.ca/mr-ce/sunset-crepuscule-eng.htm and were given pins, stickers and took pictures with many RCMP officers. We had a blast. We would like to give our appreciation to Constable J. Aimimir who organized this tour for us and other guests and to his colleague, Corporal S. Williamson, who made us understand the history of Sunset Ceremonies.